Microsoft has released a new build to the Windows 10 Mobile Insiders on the Fast ring. The latest Windows 10 Mobile 14327 brings some improvements and bug fixes to the operating system. However, it isn’t as feature-rich as the previous Insider build was. As Microsoft had promised, Windows 10 Mobile 14327 also introduces the new Messaging Experience Preview that allows you to send and receive text messages from your phone directly from your Windows 10 PC. The company was planning to release the same build to those on the desktop version of the operating system, but Windows 10 PC 14327 was held back after a last minute bug in the PCI Express. For those Insiders who are on the Fast ring, you can now test the new features and improvements that Microsoft is releasing with the Windows 10 Mobile 14327. Go to Settings > Update & Security and check for updates to get the latest Windows 10 Mobile Redstone 14327. Here is all that’s new with the latest Insider Preview build of Windows 10 Mobile. You can now try out the preview of the “Messaging everywhere” feature in Windows 10 that allows you to send and receive text messages from your phone directly from your Windows 10 PC’s. Make sure you are signed in with your Microsoft Account (MSA). 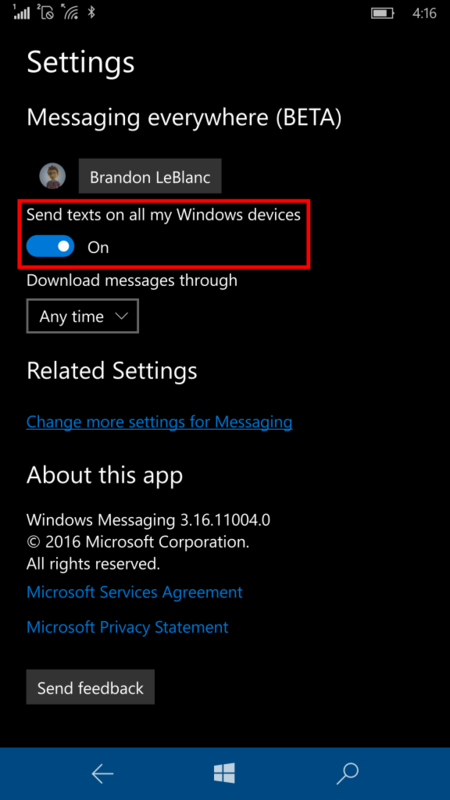 On your phone – make sure “Send texts on all my Windows devices” is turned on. On your PC – make sure you have chosen which phone to send messages through. You do this in the settings of the Messaging app on your PC (screenshot above). Try it out and less us know what you think via the Feedback Hub. NOTE: You may have noticed that Skype integration in the Messaging app in this build of Windows 10 Mobile has been removed. This is so Skype can streamline your experience, replacing the integration with the Skype UWP Preview app for mobile in an upcoming build. In the meantime, you can use the existing Skype for Windows Phone app available in the Windows Store. With this build, we are enabling Cortana for the Spanish (Mexico), Portuguese (Brazil) and French (Canada) languages for Mobile (available previously in PC builds). If you’re running the Windows 10 Mobile Insider Preview in these languages – give Cortana a try and let us know what you think. For each new market and language, the Cortana Team works to develop a custom experience that is relevant in each individual market and language. These are early versions that we will continue improve based on your feedback and we look forward to hearing more from you. Voice input is also now available for these languages. Set focus to a text field and tap the microphone above the keyboard to give it a try. We fixed the issue causing Language and Speech packs to fail to download. We fixed the issue where in some cases your phone’s screen may not turn on and become unresponsive and Windows Hello stops working if you used the power button to lock/unlock your phone quickly. We fixed the issue where in some cases, users might get in a state where neither space or enter are working on the keyboard. We fixed the issue causing Facebook Messenger and other apps like WeChat, Transfer My Data, and UC Browser from failing to launch from Start or All apps. We fixed an issue where diverse emoji couldn’t be deleted from the text box in an interactive notification. We have updated the autocorrection logic, so you can now abort an autocorrection by tapping on the bolded word. We have updated the Glance screen so it will now reflect Ease of Access text scaling. We fixed an issue where tethering over Bluetooth wouldn’t work if Bluetooth had never been turned on before. We fixed an issue where you couldn’t set a sample image as a lock screen background. For known issues and more details, please visit Microsoft.